Rettet den Drill e.V. : Emergency in Nigeria – 550 Drills need your help! Emergency in Nigeria – 550 Drills need your help! The rescue station and rehabilitation & release centre for the endangered Drills in Nigeria desperately need your help. 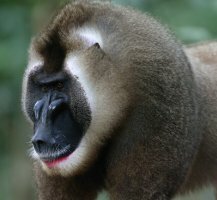 Since April 2015 the Nigerian government has withdrawn all financial support for the Pandrillus Organisation’s projects in Calabar (rescue station) and the Afi Mountains (rehabilitation & release centre). Until then, Pandrillus had received the equivalent of 3,000 € per month from the government, most of which was used to cover personnel costs. Also in 2015, the project’s main individual donor died; his monthly donation of another 3,000 € was enough to cover feeding costs for the animals. Now all the project’s savings, including the private financial assets of its founders and leaders Liza Gadsby and Peter Jenkins, are exhauste. To secure the long-term survival of 550 Drills, Pandrillus desperately needs your help! In years to come, 6,000 € will be needed each month for running costs: almost 2,400 € to pay the staff of 35, and 3,000 € for feed, plus the costs for office, housekeeping, transport, vehicles, generators etc. 1. short-term financial support in the form of donations. To avoid the high costs of single international bank transfers we’re collecting donations on our association’s bank account and will forward them directly to Nigeria. Pandrillus will be most grateful for any donation, no matter how modest! For this we are seeking reliable, financially well-situated partners who would like to become principal sponsors through a monthly direct debit. They can be private individuals, friends of the Drill, or companies and organisations. If you know potential partners in your circle of friends and acquaintances please put them in touch with us. Pandrillus was founded in 1990 by Liza Gadsby und Peter Jenkins, beginning with the Calabar rescue station in southern Nigeria, where the first orphaned Drills were taken in and cared for. Just two years later, in 1993, Gadsby and Jenkins set up the rehabilitation and release centre in the Afi Mountains about 280 km to the north. This mountain chain is the actual habitat of the Drills, and the centre is right on the edge of a large rainforest conservation area. Currently, 550 Drills live there in seven groups, along with 32 chimpanzees, in an area of over 27 hectares. 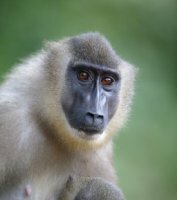 In Calabar there are also some grey parrots and 13 long-tailed monkeys that were given refuge when ‘Cercopan’ closed – another rescue station, whose work had to stop due to lack of support from the Nigerian government. Liza and Peter are struggling from one day to the next to pay the staff and buy feed to keep Pandrillus running. They work untiringly to find sponsors – because Pandrillus is the last chance for the Drills in Africa! In the whole world there are estimated to be no more than 3-5,000 Drills; their only natural habitats are in small, isolated conservation areas in Nigeria and Cameroon, and on Bioko Island. The 550 Pandrillus Drills that now desperately need your help represent 10-15% of the entire world population! Please: Help us make sure that these wonderful animals do not disappear from the face of our shared earth. For more information, contact us any time!